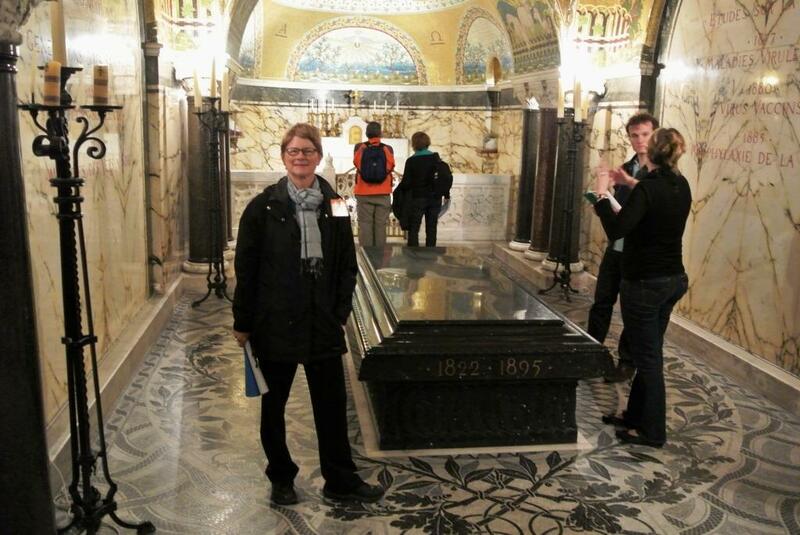 Why am I standing inside a crypt? Michael and I visited the Pasteur Museum in Paris, devoted to the work of the revered French scientist of the 19th c, Louis Pasteur. 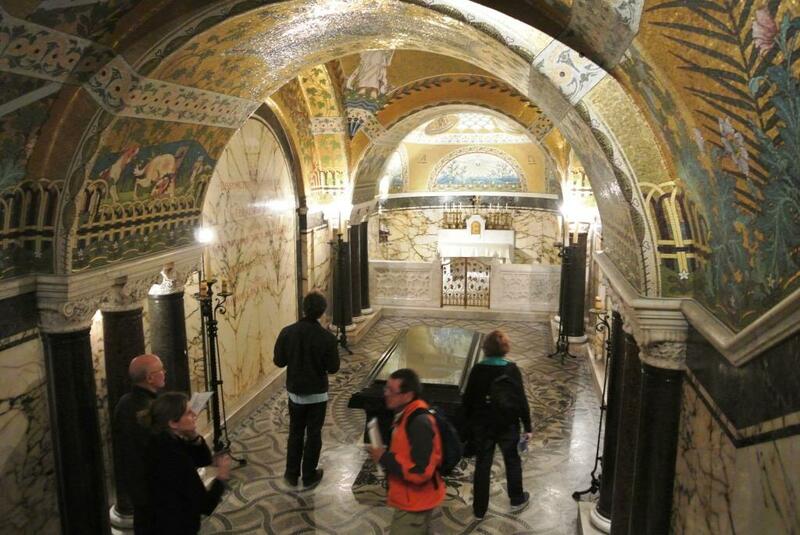 This is his crypt. Pasteur’s ashes are under the granite tomb to the right. The crypt’s decor is Romanesque-Byzantine, to put it mildly, with sparkling gold and multi-colored mosaics all around that illustrate Pasteur’s life work. 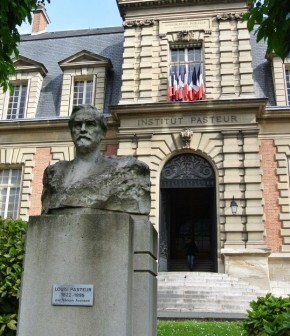 The Pasteur Museum consists of a recreation of his laboratory, the apartments where he and his wife made their home, and their burial crypt under the apartment. It’s run by the world-famous Pasteur Institute (similar to our CDC). Rabies: Pasteur studied rabies in dogs and rabbits, and from those studies was the first to develop a vaccine for dogs and a treatment for humans bitten by a rabid animal . 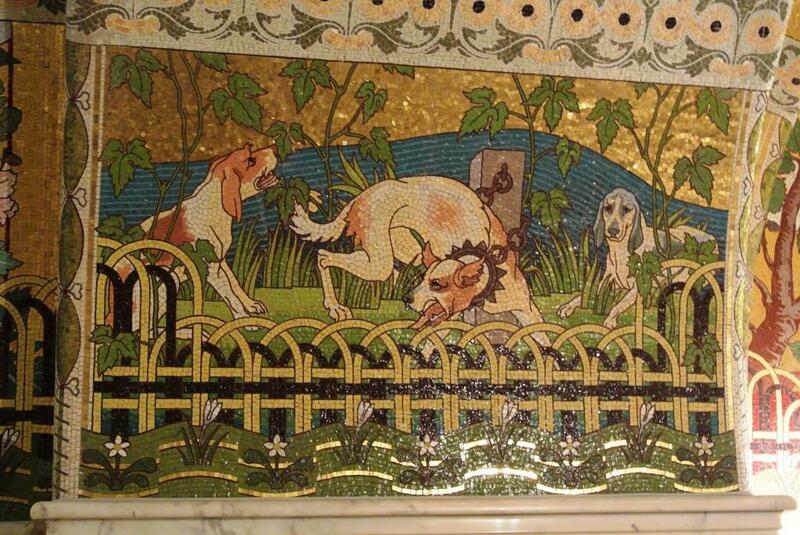 Since all the dogs in Paris, much less in France, could not be vaccinated at once, Pasteur sought a vaccine to protect humans after they had been bitten by a rabid animal. Initially, his work was proven on animals. The notion that it might work on humans was met with scepticism. He needed a success on a human. By accident, a nine-year-old boy who had been bitten by a rabid dog and was near death appeared. 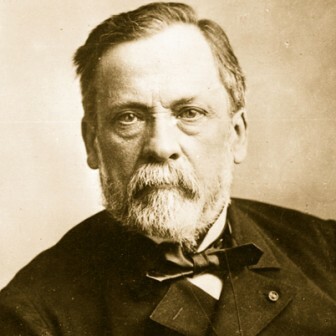 Pasteur took a considerable risk in treating the child, as he was not a licensed physician in status-conscious France, and could have been prosecuted under the law. A licensed doctor had to actually give the injection. But the boy lived, and in gratitude a member of the French nobility gave 40,000 francs to establish the Institut Pasteur. Shortly after, 16 Russian peasants who had been bitten by a rabid wolf were transported to Paris from Smolensk, Russia for treatment. Pasteur saved about half of them. The Czar of Russia kicked in with another 100,000 francs for the Institut, plus a Cross of the Order of St. Anne for Pasteur himself. The Institut is now home to 10 Nobel Prize winners. The Museum not only shows Pastuer’s and his wife’s spacious apartments, decorated in the gloomy-doomy style of the late Victorian era, but also a recreation of his lab. It’s amazing! How could anyone have discovered anything, given the instrumentation then available? Pasteur’s strength evidently came from his rigorous reliance on the scientific method in investigating problems. What else did he achieve? Anthrax: Pastuer solved was the mystery of anthrax, which saved the French livestock industry. Cows and farm animals infected with anthrax were readily identified by farmers, who then slaughtered them and buried the carcasses in the field. But anthrax kept reappearing. Pasteur showed that worms in the infected soil ascended to the surface and into the grass, to be eaten by living farm animals, thus perpetuating the anthrax cycles. Pasteurization: Pasteur also worked with the silkworm industry in France and the beer industry. For the beer industry, he worked on fermentation to discover why certain batches of beer went sour. From this came the concept of “pasteurization,” which we in the U.S. associate with milk rather than beer. Pasteur was suitably rewarded by a grand-prize medal for his work on wines at the Exposition of 1867. When Pasteur died, the nation of France gave him a state funeral at Notre-Dame, but then allowed his remains to be placed in a tomb at the Institut Pasteur. Location: . The Museum is located at 25 rue du Docteur Roux,75015 Paris. Metros: Pasteur or Volontaires. Open Monday through Friday afternoons, with tours at 2:00, 3:00 and 4:00. Closed in August. Bring a photo-ID, such as passport. Entrance fee is Euro 8, not covered by any Museum Pass. The “tour” lasts about an hour. Web site: http://www.pasteur.fr/ip/easysite/pasteur/fr/institut-pasteur/musees# . Phone 01.45.68.82.83. Note: The entrance is not well-marked. Photos are allowed only in the crypt. Who was Louis Pasteur? He born in 1822, 7 years after the end of the Napoleonic Wars, to a tanner, in the south of France, near Dijon. His father was a brave and decorated Sargent under Napoleon. Labelled a “Bonapartist” by the monarchy that was restored in 1815 after Napoleon’s fall, father Pasteur was kicked out of the Army in the reprisals that followed. Back to the tannery he went, determined that his children do well. However, son Louis did not have a promising start. His teachers in primary school declared him unusually slow and inclined to dream. But with his father’s gentle support, he persisted and eventually earned a doctorate in chemistry. In theoretical chemistry, he worked in the field of crystals, but he was also interested in applied science. His most fundamental achievement in chemistry came from work he did to aid a manufacturer who was having trouble producing beetroot alcohol. In helping him, Pasteur thought that fermentation and putrefaction, both a form of living things, were not the result of just chemical changes but that living micro-organisms were involved. But where did these living organisms come from? Pasteur showed, by the scientific method, that they were in the air. He went high into the Alps to bottle the air, as he called it, reasoning the air would be so much purer at high altitudes. He used that air to see if substances would remain pure indefinitely if they were in pure air.-i.e., germ-free air. That would mean putrefaction of substances did not occur “spontaneously” but was caused by micro-organisms from our usual, contaminated air. He was right. His resulting theory of biogenesis (living things can only be produced by another living thing) overturned a major theory of 19th c. science, the idea of heterogenesis, (living things can generate spontaneously from non-living things). Pasteur is rightly considered one of the three founders of micro-biology. Although he did not, as is often popularly thought, “discover” the germ theory of disease, he helped it along immensely. To make people, not just animals and plants, healthier, Pasteur proposed that bad microorganisms, once inside people, make them sick, which led to all sorts of changes in medicine to keep harmful micro-organisms out of the human body. In addition to Joseph Lister’s work with antiseptics in surgery, Pasteur promoted the unheard-of notion of surgeon’s washing their hands and instruments. 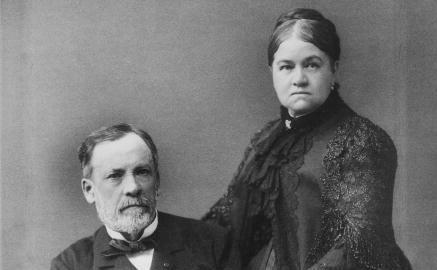 Pasteur married a daughter of the Rector of the Strasbourg Academy, Marie Laurent. They had five children, of whom only two survived childhood. Marie lived to the age of 84, and is buried in the crypt with husband Louis. Louis Pasteur in many ways embodies the social and political transformation of France in the 19th c.From humble beginnings–a working-class father on the wrong side of the political regime to highest honors and a comfortable life– Pasteur’s life showcases the possibilities in 19th c France for the educated, the hard-working, and those interested in science. Because of this dedicated scientist and his supportive wife, we all live healthier lives. This entry was posted in Paris France and tagged 19th century, anthrax, biogenesis, chemistryt, crystals, fermentation, French Science, germs, heterogenesis, Institut Pasteur, Joseph Lister, Louis Pasteur, Marie Laurent, Marie Laurent Pasteur, micro-biology, microbes, putrefaction, rabies, Science, vaccines on Monday, May 27, 2013 by Nancy J Padgett.